These instructions are to build an easy to use LED audio transmitter that will enable you to transmit an audio signal over a distance of a few inches to several feet. 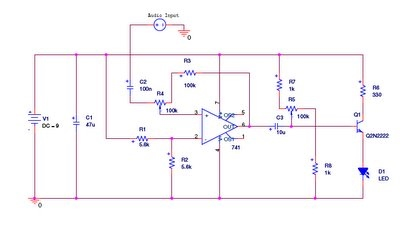 This transmitter uses an amplitude modulated signal to transmit an inputted audio signal over the light of an LED. Amplitude modulation is achieved by increasing the amplitude of the output signal for higher voltage values of the input. This signal can then be demodulated into the original audio signal and then played on a speaker. The following lists detail all of the parts that are required for this project. Parts can be varied due to availability but need to stay within the same general specification as listed below to ensure correct operation of the circuits. Please feel free to experiment with different parts to determine which ones work best.